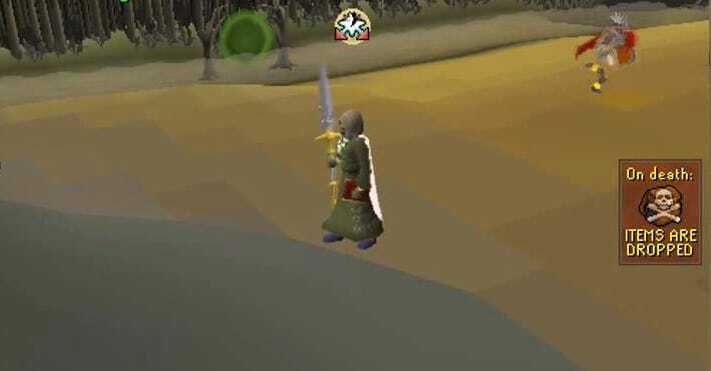 Luring is when one RuneScape player leads another player to a dangerous place in the game, most often in the Wilderness. Since this is usually done trough trickery or deception, it is considered scamming. Luring is usually done when victims have a valuable RS item or RuneScape gold with them so that when they die, they will lose the items or gold to the lurer, who then proceeds to pick it up. Some players can not only lure to kill, but also just for fun. So how can you prevent being lured into the Wilderness? Never drop items or gold in the Wilderness! Also, get to know the methods players use to lure others into the Wilderness and avoid them. Beware of Revenants, as well as players who are trying to fake a drop party, sell RuneScape items for a ridiculously low price or buy RS items for unrealistically high price. And remember, the lurer will always have a good reason for trading in the Wilderness, be it they are power-fletching or woodcutting trees, depending on the location. Team up only with players you know! Also, ensure that your team-mates don’t bring with them valuable RuneScape items into the Wilderness that can be attractive to lurers. In the Wilderness, luring players may use stun abilities and freeze spells to prevent other players from escaping. This can makes it potentially dangerous to even set your foot in low-level Wilderness. Lurers may mislead their victims by running into areas that have multi-way combat, forcing them to follow when accepting. Luring players often act like low-level players asking higher level players to show them where a certain location is. To ensure the victim will drop the item on dying, the lurer will try to lure other players that are selling stacked items or are buying in cash. Stacked items or cash not in the money pouch are always lost on death. Lurers use this fact. Another method luring players use is to lend a precious RS item or RuneScape gold to the victim player. This way they ensure that their item or money will be lost, leaving the lurer with the loot, except for the borrowed item in the victim player’s inventory. Since luring in the Wilderness is becoming more and more common these days, RuneScape rules concerning it are getting more ambiguous. Sometimes luring can be punished even as scamming. It’s good to know that players can report each lure as scamming if they want to. This entry was posted in How-To Tips & Tricks, Latest OSRS News, Old School RuneScape, OSRS Mobile App and tagged buy old school runescape item, buy oldschool runescape gold, buy osrs items, sell oldschool runescape gold, sell rs2007 gold, sell runescape gold. Bookmark the permalink.